Speculation about the future of the Panguna copper mine in Papua New Guinea’s autonomous region of Bougainville, which ignited a decade long civil war in the 1990s, peaked late last year when an application for exploration by former Rio Tinto subsidiary, Bougainville Copper Ltd (BCL), was put to a local vote. When those with mining interests meddle with Panguna, it makes people revisit the pain and suffering, and the horrors of war that the government wrought on its citizens for closing down a mine, which they felt had not compensated them enough for their loss. The mine still stands in ruin. From the Morgan Junction checkpoint near the entrance, the drive is long and winding up into the white mist that often veils the peaks of the Crown Prince mountain range. In a valley at the top is the scene of a time warp: rusting mine machinery disintegrating into the all–consuming jungle, rows of silenced trucks and gutted housing blocks. 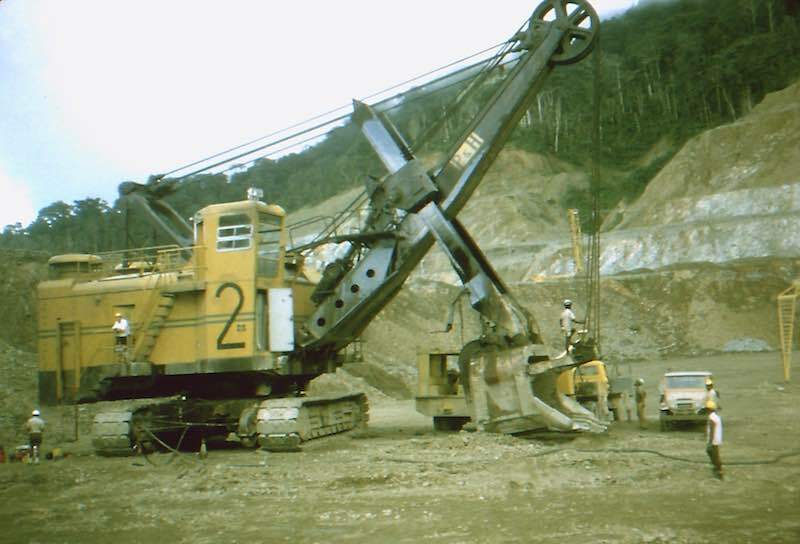 In 1989, the Nasioi on Bougainville were the world’s first indigenous people, angered by inequity and environmental damage, to shut down a multinational mining venture. But the feat came at a huge cost. 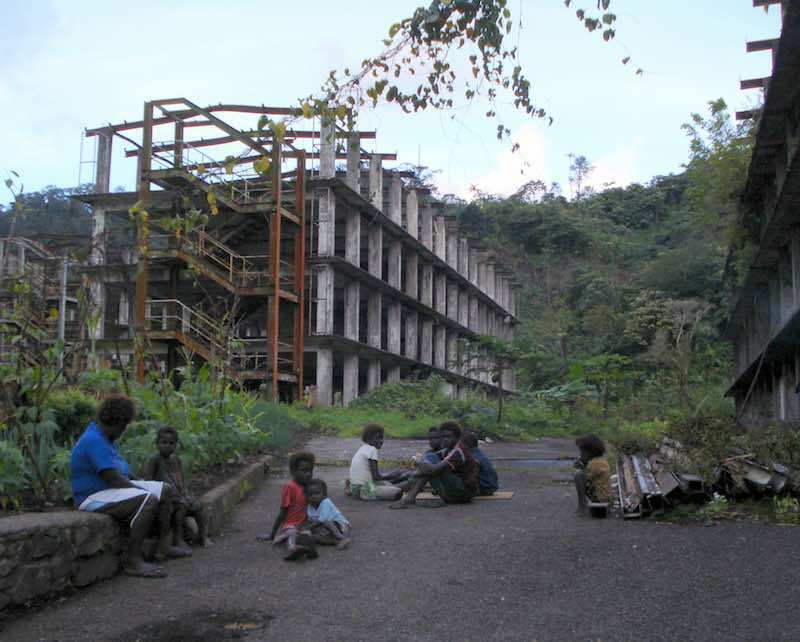 The ensuing civil war, primarily between local rebel groups and the PNG Defence Force, decimated infrastructure and development and left 15,000–20,000 people dead, with many more suffering still from untreated trauma. Yet debate about the mine’s possible revival has persisted for the last eight years. It’s the focus of the Bougainville autonomous government’s ambitions of fiscal self–reliance as an independence referendum approaches in June 2019; an enormous challenge for a region still occupied with post–conflict reconstruction and heavily dependent on aid. Last year, only 14% of the government’s expenditure, totalling K162 million ($67 million), was covered by internal revenues, while experts point out that an independent nation of Bougainville will need a budget two to three times greater. This is a dilemma for many Panguna landowners. A few years ago, as I sat with villagers near the mine pit, no–one expressed a wish for mining to return to this beautiful valley. But views faltered among those committed to secession. Janet Colman from Guava Village said she did “not really” want the mine to reopen. If I had a choice, but I don’t think I have a choice. If I am crying for independence; then I need the mine. When BCL’s latest bid was defeated, Bougainville’s President John Momis announced an indefinite moratorium on exploration and mining in Panguna, highlighting his fears of potential conflict between landowner factions. However, the link between mining and political aspirations continues to fuel the contest for Panguna’s wealth. Other foreign companies are jostling for position, such as Perth–based RTG Mining, which has forged an alliance with Philip Miriori, former combatant and now president of the Panguna–based Mekamui government, and chairman of the Special Mining Lease Osikaiyang Landowners Association. people who come from around the mine area are not homogenous, and deep divisions exist along family and clan lines going back to the time before the Crisis. Mining companies now understand they will not be successful without landowner support. At least five ex–combatants and local leaders are known to be entertaining a range of corporate interests from Australia, Canada, China, Brazil and the US. It is another hurdle for Momis and his government, who are working to rally a sense of political unity in a Melanesian society, where people still prioritize allegiance to their clan and customary land. Suspending developments in Panguna aligns with those landowners, such as Lynette Ona, Chairwoman of the Bougainville Indigenous Women’s Landowner Association, who believe the mine should stay closed until they can master their own destiny. Yet independence in itself won’t remove landowner rivalries or other risk factors Bougainville is currently challenged with, such as high youth unemployment, constrained institutional capacity to reach and govern rural areas and incomplete disarmament. Some armed groups, such as the Mekamui Defence Force, didn’t sign the peace agreement or surrender firearms. Helen Hakena of the local Leitana Nehan Women’s Development Agency has expressed concern that “they [the Mekamui] get their strength from guns … there needs to be a priority set by the government in getting those arms out before the reopening of the Panguna mine”. Bougainville is still working toward establishing the post–war unity, strong governance and state resources that are needed to manage the complex combination of post–conflict recovery, unaddressed mining grievances, and risks of resource–related corruption and land disputes. For mining, without peace, won’t contribute to Bougainville’s longing for successful self–government and equitable development. The facility is seen as an egregious example of how Beijing is using loans and aid to curry strategic influence in Asia.